Three Early Bird: Crop Management Series meetings have been scheduled in November to help farmers make decisions on early purchases and pre-purchases. The meals are sponsored by the Kentucky Corn Growers, Kentucky Soybean Board and the Kentucky Small Grain Growers. Nematodes are microscopic roundworms that attack roots of corn and other plants (Fig 1.). In corn, nematodes affect yield by damaging the root system. They become more important when there are other root-related stresses in the same field, such as moisture shortage, root damage from insects, or compaction. In the past, soil-directed organophosphate and carbamate insecticides gave some secondary suppression of nematodes. Currently, more selective insecticides, and Bt corn for corn rootworm control, don’t provide secondary suppression of nematodes. The increase of no-till production can favor certain nematodes that are sensitive to tillage (needle and dagger nematodes). More corn-following-corn also favors the needle and dagger nematodes. Figure 1. 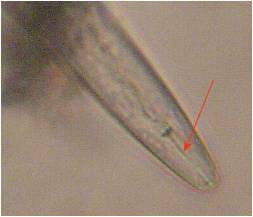 "Head" of nematode, showing the spear-like stylet (arrow) that it uses to puncture plant cells. The threat nematodes pose varies greatly from one field to the next. The best way to determine whether nematodes may be hurting yield is to sample for nematodes. While winter temperatures will cause some nematode mortality, sampling in the autumn after crop maturity gives a producer time to react to findings, by obtaining seed treated with Avicta® seed treatment or considering an alternative crop. Figure 2. Range of populations of lance nematode in 33 Kentucky corn fields sampled in 2009. For sampling in the autumn, use a soil probe and sample within the row—that’s right, within the row. This is different from sampling for soil fertility. Sampling within the row allows you to get a count of destructive endoparasitic nematodes (lesion and lance nematodes), because many of those adults leave the root as the crop dries down and the roots die. Sample when the soil is moist but not wet. Walk a zig-zag pattern, and take 20 cores to a depth of 12 inches. Gently mix these cores in a container. Don’t let them dry out nor be subject to temperature extremes before mailing as soon as feasible to a nematode laboratory. During grain fill, many Kentucky corn fields experienced high temperatures (highs above 90°F, with warm nights) and drought conditions, which favor Aspergillus infection and aflatoxin contamination of the kernels. 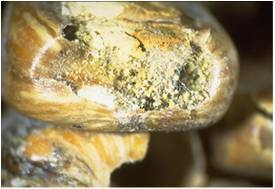 Kernel injury caused by insects, mechanical damage during harvest or handling, or other causes can lead to an increase in aflatoxin levels (Figure 1), though infection and contamination can occur even in undamaged kernels if conditions are highly favorable for the fungus. Figure 1. Yellow-brown sporulation of Aspergillus flavus in an insect-injured corn kernel. Mycotoxins such as aflatoxin can accumulate in corn in storage.Table 1 below provides recommended conditions that will suppress mold growth in storage. Corn with evidence of mold or mechanical damage or excess trash should be held at 0.5 to 1% lower moisture content than recommended here. Monitor stored corn regularly for mustiness and grain heating. Permissible levels Aflatoxins are regulated at the parts-per-billion level, an extremely low level. To put this in perspective, one part-per-billion is equivalent to one second in 32 years, or one kernel in a 10,000 bushel bin. For many uses, grain must have less than 20 parts-per-billion (ppb) of aflatoxin. However, there are some permissible uses for corn with higher levels. For example, mature cattle can be fed corn with up to 300 ppb aflatoxin. Details on the permissible levels of aflatoxins in livestock feeds and human foods are available in the UK Extension publication, Aflatoxins in Corn, ID-59, http://www.ca.uky.edu/agc/pubs/id/id59/id59.pdf. Examining the kernels for yellow-green fluorescence under a blacklight is commonly used as a quick preliminary test. The entire sample should be cracked or coarse-ground for blacklight testing. However, yellow-green fluorescence under a blacklight does not indicate the presence of aflatoxins. Fluorescence simply indicates that aflatoxins may be present in the kernel. A blacklight test can often give a "false positive"; that is, a positive result from a clean load of corn. A similar glow under blacklight may be produced by tips of corn kernels, corn beeswings (glumes), soybean hulls, certain weed seeds, and strains of A. flavus that do not produce aflatoxins. Plus, it is also possible to get a negative blacklight result from a contaminated sample. Thus, blacklight testing is not considered to be a reliable method for detecting aflatoxin. Aflatoxin testing is notoriously variable. Sampling for any contaminant in grains at the parts-per-billion level is highly variable. See Table 2 below for an illustration of this variability. Table 2. Aflatoxin test results (parts-per-billion, ppb) in ten properly collected samples obtained each of three peanut lots (arranged in ascending order for ease of interpretation). One can’t prevent this sort of variability when testing for aflatoxin, but one can make it worse by not sampling correctly. The recommended sampling procedure for corn is as follows: Take at least ten probefuls and collect at least 10 lb of corn. The corn must be below 16% moisture unless the test is being performed immediately. Test results from high-moisture corn may not be accurate if the test is delayed, as the fungus can continue to grow and produce aflatoxins. The 10-lb sample must be ground and mixed well before drawing a small subsample for testing. The AOAC International (formerly the Association of Official Analytical Chemists) requires that the entire 10-lb sample be coarsely ground to pass through a No. 14 sieve and mixed, and that a 2- to 4-lb subsample be ground to pass through a No. 20 sieve (about the consistency of fine instant coffee), before aflatoxin testing. Test kits are available from several manufacturers. Some of these test only for the presence or absence of aflatoxins. Other, more sophisticated kits estimate the concentration of aflatoxin. If using one of these, grain should be ground and mixed as described above, and operators should be well-trained in the use of the particular test kit being employed. Analytical laboratories provide the best estimates of aflatoxin concentration. Drawbacks of laboratory testing include expense and time delays while waiting for results. Stored corn should be managed as described above, so as not to allow aflatoxin accumulation in storage. As far as planning for the 2011 crop, any fields with aflatoxin this year have only a very, very modest increase in aflatoxin risk next year. Of course, most of those will be rotated as normal, and aflatoxin is only a concern in corn. Even for those that are sown to corn in 2011, aflatoxin contamination is driven much more by environmental conditions than by cropping history and agronomic practices. Of course, since aflatoxin contamination is commonly associated with drought and grain damage, it is advisable to use good agronomic practices such as: sowing adapted hybrids, avoiding excessive plant populations, reducing soil compaction (if present), and managing kernel-feeding insects. A multi-state Extension publication entitled Moldy Grains, Mycotoxins, and Feeding Problems is available at http://www.oardc.ohiostate.edu/ohiofieldcropdisease/Mycotoxins/mycopagedefault. The Missouri Soybean Association announced that Kip Cullers has broken the record again with a soybean yield of 160.6 bu/acre in the 2010 Missouri Soybean Yield and Quality Contest. To make this valid entry, Kip had to harvest at least two (2) acres and then harvest a re-check of at least (2) acres. This contest field had to be in a field of at least 10 acres in size. A person approved by the Missouri Soybean Association monitored both the check and re-check. Kip is no stranger to winning the Missouri Soybean Yield and Quality Contest, having recorded yields near 155 and 139 bu/acre in 2006 and 2008, respectively. He is a very intelligent producer and really works hard at finding ways to boost yields. There is no doubt that each producer reading this is curious as to just how Kip is doing this. What are his production secrets? There is no doubt that if I worked for a company with a product that was used in Kip's fields, I would advertise it like crazy this fall and winter. Since I work for the university, let me caution against getting extremely excited about any one product by itself. As Kip says, there is no silver bullet to high yields. Kip is employing a very unique system in his operation. It is that overall system that is generating phenomenal yields. Weather is a major player as well. Kip isn't getting these record-breaking yields every year and weather is a major factor in that. So, as you look at some of the products used on Kip's fields, remember that these products are being used in a very unique system. . . your challenge and mine is to determine what components of his management system might apply to a non-irrigated Huntington, Pembroke or Crider soil in Kentucky. I am sure there will be more to come on this topic as the fall and winter sales season unfolds. Click here to see the original press release from the Missouri Soybean Board. Click here to see the Missouri Soybean Yield and Quality Contest rules. Researchers just published an article on the impact of Bt-corn in the corn belt in the October 8, 2010 edition of Science. They specifically examined Bt-corn with resistance to European (and Southwestern) corn borer. 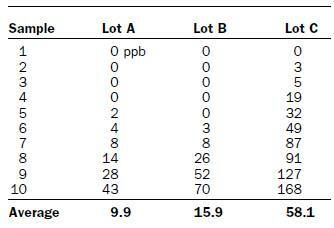 By examining insect counts in Bt and non-Bt fields along with production statistics, etc. the authors concluded that the benefits for using the Bt-corn was $6.9 billion to growers in Illinois, Minnesota, Wisconsin, Nebraska and Iowa over 14 years. Of that total, they estimated that $4.3 billion was for growers with non-Bt corn hybrids. The benefits come with reduced European corn borer populations in Bt corn fields as well as nearby non-Bt corn fields. For example, in Minnesota, when only 40% of the corn acres were planted to Bt corn, European corn borer larvae declined by 73% over all corn acres. After calculating the estimated reductions in European corn borer larva, the authors also included the estimated yield losses from corn borer damage and the resulting yield increases from reducing the corn borer populations. The authors also included the difference in seed costs between Bt and non-Bt corn hybrids. A larger share of the economic benefit goes to growers of non-Bt corn because they are paying less for seed, but reaping similar benefits to their neighbors who raise Bt corn. The authors did not include the cost of spraying an insecticide on non-Bt corn when corn borer populations warrant such an application. Once the cost of spraying an insecticide is considered, the economic benefits of Bt corn with corn borer resistance might be even higher to the producer. The original article in Science is titled: Areawide Suppression of European Corn Borer with Bt Maize Reaps Savings to Non-Bt Maize Growers. Commodity prices have soared since Friday morning when the USDA released their October Crop Production report. From Friday morning to the end of the trading on Monday October 11, 2010 Corn price has climbed over 11 %, soybeans are up over 8%, and wheat is up over 7%. Price increases were being driven by the significantly lower than expected US average corn production number of 12.6 billion bushels, which was almost 500 million bushels smaller than the September report. Corn acreage was increased while yield was significantly reduced. Additionally, US average soybean production was reduced by 75 million bushels from the September report to 3.4 billion bushels. News of the USDA report shocked commodity prices, pushing corn and soybeans to daily price limits ($.30 per bushel for corn and $.70 for soybeans). This type of price volatility will get (and keep) everyone in commodity markets uneasy. Producers are faced with increased pressure to sell since prices have moved limit up. Purchasers are meeting in board rooms attempting to figure out strategies to minimize the effect of an 11% price increase. Lots of uncertainty remains in the market. This leaves room for additional significant price movement (this doesn’t mean always up) over the coming months. Significant price increases will eventually show up on the demand size as reductions in use. This will bring back some ending stocks and likely bring prices down. When this will happen? – Don’t know. Getting wheat into the ground right now is a real challenge because of the dry, hard soils. Since many producers have locked in high market prices for next summer, we are assuming that all producers reading this fully intend to plant wheat. So, in the discussion that follows, we are removing the option of “not planting wheat”. With this in mind, producers have two options for planting wheat: 1) plant now and hope for rain, or 2) wait for rain and then plant. Both options have their risks. Positives: You get the wheat planted, perhaps a little early, but it is in the ground. Getting seed at the proper depth will be a challenge (see action item below). Risk 1: Hessian fly. The recommended first dates to plant wheat in Kentucky are October 10 in northern Kentucky and October 15 in southern Kentucky. These dates are based on historical Hessian fly free dates and also coincide with first fall frosts. These dates are earlier than the first frost, recognizing that wheat germination is normally several days after seeding. The soil is so dry right now that any wheat planted is not going to germinate until we get rain. So, the risk of planting a few days early is minimized some this year because of the lack of soil moisture. Risk 2: Just a little rain. The wheat will not germinate until we get rain. One of the worst things that can happen is to get a little rain (maybe half an inch), which is enough to let the seeds germinate but not enough for the young seedlings to survive without additional precipitation. Risk 3. Varmints. The longer seed stays in the ground before germination, the greater chance there is for mice, voles, etc. to dig up and eat seeds. Risk 4. Soil Erosion. Seeding now may require some tillage to allow the grain drill to get through the soil surface (see Action Items below). If you do tillage, you increase the chances for soil erosion from wind and water. If you have fields that are rolling and you use tillage on those fields, a heavy rain could do severe damage to your fields. 1. If you decide to plant now and hope for rain, get the seed about 1- to 1.5-inches deep. In a year like this, there is no “seeding to moisture” unless you plan to use a backhoe in place of a grain drill. With soils that are very hard, you may need to run a disk over the field to break up the soil and allow a drill to get through. If you decide to do this, then try to do as little tillage as possible while breaking up the soil. Set your disk blades to run straight so the implement is not throwing dirt into the air, but simply slicing through the soil. 2. Calibrate the drill so that you are delivering the correct rate of seed. Perhaps increase your seeding rate a little since you have some slightly higher risks of seed loss. 3. Monitor fields once the rains come to determine the quality of your stands. Positives: By waiting for rains, the soils will be softer, getting proper seed depth is easier, and tillage is not necessary. Risk 1. Later planting date. If you wait for rain, it could rain and rain and rain. This could push back the planting date, leaving you to scramble to get wheat planted. The later planting dates could result in lower yields, as research indicates. 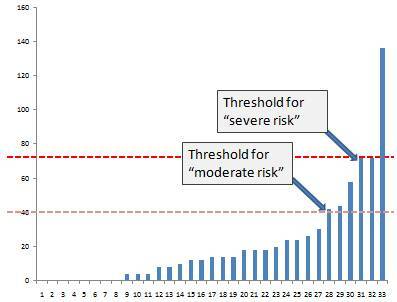 Risk 2. Soil Compaction. This sounds crazy given the current soil condition, but if it rains a lot, you could find yourself trying to plant into wet conditions, which can lead to soil compaction. 1. Calibrate your drill with all seed lots. Since you are not going to plant right away, you might as well make sure that your equipment and seed are ready to go as soon as possible. Once the rain comes and the soils soften, you don’t want to waste a day getting machinery ready. Do it now, while you have the time. 2. As soon as the rains come, get to the field and get the wheat planted. Since many fields have several soils types, you may have areas of a field with more soil moisture than others… or different fields with different moistures. You will want to double-check seeding depth when entering new fields and you may want to check it when entering different soil types in the same field. 3. Put blinders on and develop nerves of steel. The blinders are to prevent you from seeing your neighbors trying to plant wheat before the rains. The nerves of steel are needed when the blinders don’t work.